It may be 100° F in the shade with heat indexes pushing even higher, but autumn is definitely squeezing its way into the garden. Sunset is earlier–by a minute or so each day–and though many plants are hunkering down to get through the blisteringly hot next weeks, there are some plants changing into their fall wardrobe. 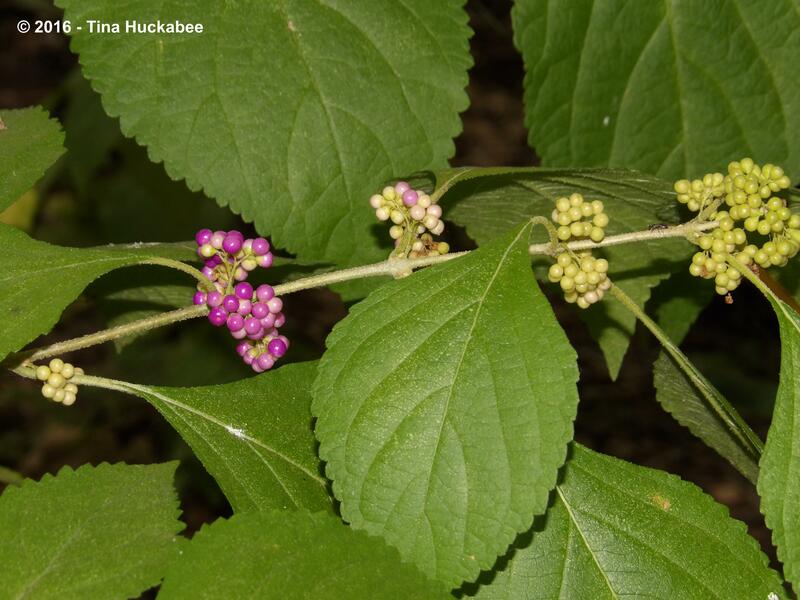 The American beautyberry, Callicarpa americana, is slipping from summer’s green, unripe berries to the autumn–and edible–metallic purple yummies. If this gardener is lucky, the Mockingbirds and Blue jays have plenty of other berries to eat for now and will let me enjoy the visual beauty of the berries, if only for a short while. Bird snacks notwithstanding, autumn is just around the corner. All my beautyberries have already turned purple. I saw a mockingbird on them today! I love the white-berried beauty. It’s rare around here, though when I worked at Zilker Botanical, there were two, sided-by-side. Goodness they were gorgeous! 100 degrees in the shade? Wow, that’ s hot. Callicarpa is lovely, I didn’ t know that the berries are edible. Nothing eats them here, so they hang on for some time. 102 today, with a heat index of 112. It’s a hard few weeks, these first weeks of August. We’re supposed to get a cool front and some rain this weekend, so this might be the last of the really hot. We won’t cool off in earnest though until October. The change is subtle, but I’ve noticed it, too—mainly the light and the return of the hummingbirds. Whoever came up with the name Beauty Berries got it right. So pretty! I love Beauty berries and couldn’t agree with you more! I’ve also noticed the change in light and some Texas birders have noticed that fall migration of the songbirds has begun. I noticed the Beautyberries on the greenbelt have berries, but not yet turning. Some of my Salvias have started their autumn blooming. We are being promised rain in the near future and temperatures returning to the normal mid 90″s. Hopefully, the rain will head your way too. Yes, the rain is being forecast for the weekend. Fingers crossed! 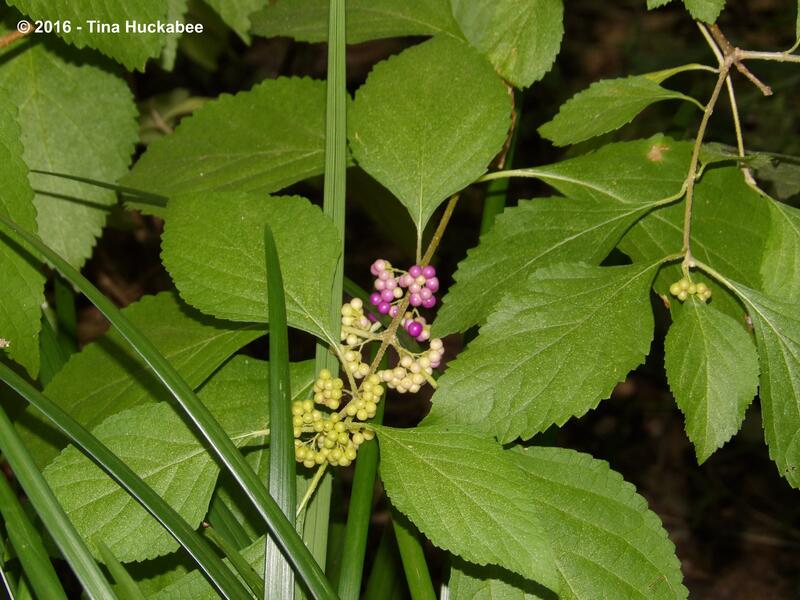 I just saw beautyberries beginning to turn yesterday, at one of our Houston-area nature centers. The poor plants could use some rain, though. The leaves are sad and drooping where they’re not getting any supplemental water. At least there’s a decent chance of rain in the slightly extended forecast. Beauty berries are sad when they’re thirsty. I hope you (and the beauties) get some much-needed rain soon. Your beauty berries look gorgeous! Mine have struggled this summer. I don’t think it has raines here in college station more than twice. Between the floods in Spring and the drought in Summer, mine are just limping along. :(. I had no idea there was a white variety. I’ll hae to look into those. This amazing shrub is in my plans. They really add beauty to a landscape! It’s a great one–you AND the birds will love it! Your beauty berries are way ahead of mine. No sign of color but, like you, I know who will be around as soon as they do. I can’t blame him because he did plant them all along the wall. After I pulled mine out a few years ago for getting too big. Same with chile pequin and pokeweed. He’ll be back to his winter quarters soon. Ha! Those birds love beauty berries! Funnily enough, I’ve never had any seed out in my garden. Everything else seeds out, it seems, but not beauty berries. Enjoy the purple when it comes! Tina preciosa planta y preciosas bayas color púrpura ya listas para comer. Se acerca el Otoño aunque estemos muertos de calor. Mi Lavandula angustifolia está en la cumbre de la floración, de ahí a empezar a formar semillas en las espigas le falta muy poco : algunas ya han empezado a secarse. Saludos de Margarita. I’m glad you have something flowering for now, while it’s hot and yes, fall is coming!! Tina su planta es preciosa y sus bayas color púrpura también. Ya se acerca el Otoño y aunque nosotros nos estemos muriendo de calor las plantas siguen su ritmo. Mi Parthenocissus quinquefolia ya ha formado todas sus pequeñas bayas : ahora están madurando. Saludos de Margarita. I love these purple berries–always lovely and cheery! 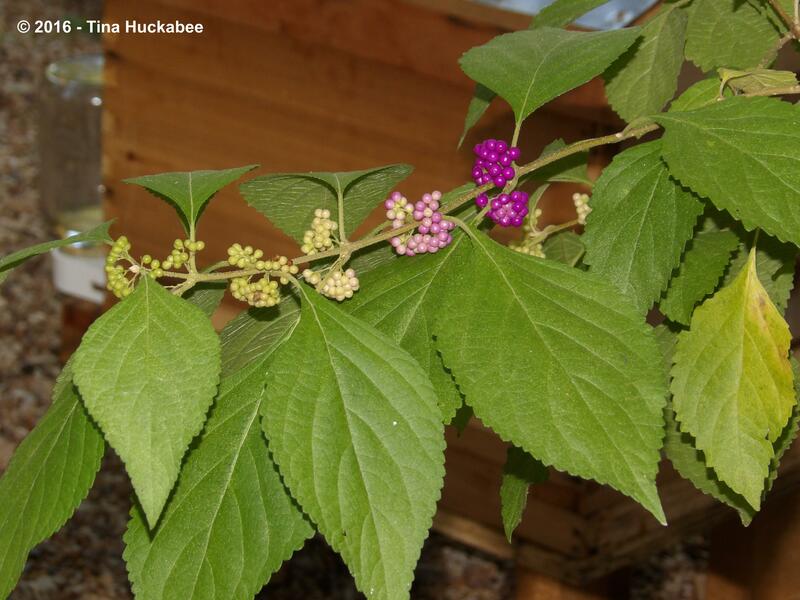 Beautyberry is so well-named! I wish I had one. But as for 100 degrees in the shade – no thanks.